At the recent World of Concrete Event in Las Vegas, Nevada, Bosch announced their newest track saw. The 13-amp Bosch Track Saw aims to deliver extreme accuracy as a more portable alternative to table saws. The main takeaway with the Bosch Track Saw is that it operates as a more portable alternative to a table saw. 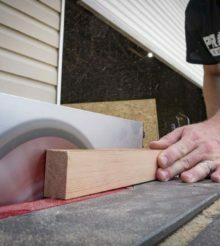 Rather than lugging around a cumbersome table saw from site to site, you can plop down this 10 lb saw and its tracks to get the same quality with your finish cuts. With its single pivot point, this saw can make bevel cuts from -1° to +47° and you won’t have to position the saw any differently to make straight or bevel cuts. The saw pivots the blade at the base of the track, so it cuts through the same point at any angle. The footplate is made of magnesium to help keep the weight down some. At 10.4 pounds, it’s heavier than Makita’s SP6000J and Festool’s TS 55 but quite a bit lighter than their TS 75. Gliding on a track, the weight isn’t as big of a deal as the saw’s ability to cut accurately and cleanly. The Bosch Track Saw pairs its 13-amp motor with a 6-1/2″ blade with variable speeds from 3,600 RPM to 6,250. The stock blade is a 48-tooth model to give you solid finish cuts for most general applications. You can always go with a higher tooth count when you need a finer finish. The RPM is noticeably higher than some of the other track saws out there and that will give you faster cutting on material and blade combinations that can handle it. You can pick up the Bosch Track Saw for $599 without any tracks. That’s not an unusual move since one track isn’t going to be the perfect size for everyone. Here’s how Bosch’s price stacks up to their competition. Bosch is setting a price point well ahead of their competition from DeWalt and Makita. It’s actually sitting close to the DeWalt’s cordless track saw ($579) and ahead of Makita’s 18V X2 kit ($499). In order to sell well at that price, Bosch is going to have to impress Pros right out of the gate. On paper, it looks like it’s ready to compete against Festool or anyone else, but we’ll have to wait to get our hands on it before we know for sure. The big question is if Bosch is setting the stage for a cordless model using their Core18V battery. When and where can we buy this? Nice review. Now if milwuakee would just make a track saw.